High in the North Cascades, rare alpine plants make their home above the tree-line. Photo by Wendy Gibble. 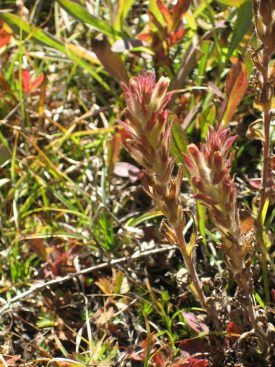 Obscure paintbrush (Castilleja cryptantha) at Mt. Rainier NP. Photo by Marilee Henry. As avid plant enthusiasts and admirers of the natural world, many of you have experienced the beauty and wealth of plant diversity offered in Washington’s National Parks (NP). They protect 28% of our state’s subalpine and alpine ecosystems, which include 300 forbs, grasses, and sedges adapted to the extremes of high-elevation life. Of these, many species tracked as sensitive species by the Washington Natural Heritage Program are protected within their borders including 38 tracked species found in Olympic NP, 10 in Mount Rainier NP, and five within North Cascades NP. These parks provide habitat for species at the southern edge of their ranges, like that of Kotzebue’s Grass-of-Parnassus (Parnassia kotzebuei) and snow cinquefoil (Potentilla nivea), as well as harbor species endemic to Washington, such as obscure paintbrush (Castilleja cryptantha) of Mount Rainier NP and cut-leaf synthyris (Synthyris pinnatifida var. lanuginosa) of Olympic NP. Above the tree line, the alpine zone has long been referred to as islands in the sky. Their irregular and exacting terrain along a steep gradient create microhabitats over short distances. This patchwork of unique microhabitats have become a cradle for speciation over the course of millennia. It is for this reason that some alpine zones, like those of the Olympic Mountains, can be places of high endemism. However, this distinctive nature of alpine zones also makes them particularly vulnerable to the impacts of climate change. As the climate warms, alpine species with narrow climate envelopes may not be able to retreat any higher. Their options for survival are limited. They can tolerate changing conditions, adapt, move, or go extinct. We hope to prevent the latter and better understand if the former options are possible. So how does Rare Care approach a monitoring project of this scale… three parks, 5 to 10 species per park, and three summers for fieldwork? Currently, Rare Care is selecting species and sites for study. Our information gathering efforts are revealing large data gaps for many of the species identified as potential candidates for monitoring. Data on population sizes, reproductive strategies, pollinator relationships, and seed viability are scant at best. For this reason, our first field season will be filling these gap with sound observational data. To help us with this work, we are excited to have two interns join our team this summer: Maya Kahn-Abrams and Callie Zender. They both graduate this spring from college, Maya with a microbiology and environmental biology degree and Callie with a plant biology degree. They will join us in June and will spend their summer trekking through islands in the sky of our treasured national parks. Together, with the support of the National Park staff, we expect a fruitful year of research and look forward to sharing with you our preliminary findings in the fall.